The Galaxy application is the flagship service within CloudMan. Usage and general configuration information for the Galaxy application is available throughout this wiki. This page focuses on service features available within CloudMan as they affect the Galaxy application. A Galaxy Administrator user has additional privileges and can install/manage tools from the Tool Shed, manage users, libraries, set quotas, etc. Complete documentation on the Galaxy Admin Interface is available here. In order to become an Admin user on the CloudMan instance, head to the CloudMan Admin page and type comma-separated email addresses for users you would like to become Admins (see screenshot below). Note that those emails should be registered users with this Galaxy instance. Then, click Set admin users and wait for Galaxy application to restart; refresh your Galaxy window and an Admin tab will become visible in the masthead. To ensure proper operation of the Galaxy application, CloudMan manages many of the Galaxy configuration options (e.g., file paths). In the future, we plan on providing a method for a user to update some of those settings in a more interactive fashion but for the time being, those settings are coded within CloudMan. If you need to permanently change those settings, it will be necessary to change populate_galaxy_paths method in this file and use your custom version of CloudMan when starting your cluster. See this page for more details on how to do this. Additional Galaxy configuration options can be found on the Galaxy Admin page. 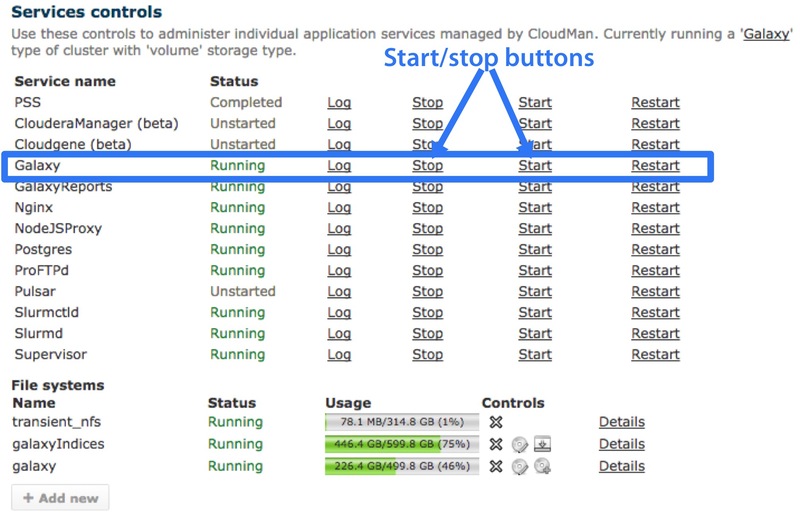 By default, CloudMan is configured with the Main and Test Tool Sheds. If you would like to add another Tool Shed, it is necessary to edit file /mnt/galaxy/galaxy-app/config/tool_sheds_conf.xml and restart Galaxy (via CloudMan Admin). The newly added Tool Shed will become available on the Galaxy Admin -> Search and browse tool sheds page. By default, the installed Galaxy application is on release_<version> branch so updating it will update that particular release. If you would like to update to a different release, it is necessary to also change to the desired git branch.